Due to a high number of late registrations, we are closing registration for the 2019 baseball season on April 17 at 6:00 PM. The teams have been posted on our website and our teams are full. Thank you to everyone that registered for baseball. We have over 200 players playing ball this season. 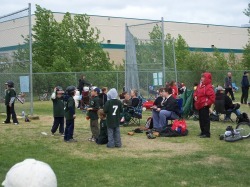 Please note that there are some changes in the names of some of age divisions this year, as per Baseball Saskatchewan. Please ensure you check the changes. TOURNAMENTS - Your child's age division may be invited to travel to another community to play in a tournament. All players at that level will be informed and are invited to participate. More information will come if/when there is a tournament. This generally applies to the MOSQUITO and PEE WEE divisions. Please talk to your coaches for more information. It is difficult to predict the weather in Saskatchewan so the following is the procedure we will follow for future rain outs. Remember to please check your e-mail to receive the most updated info regarding rainouts. This is the quickest and easiest way to contact people. If you are not sure if baseball is cancelled or not, please show up at the ballpark. Jr Rally Cap - We will cancel baseball at 5:50 PM. Sr Rally Cap - We will cancel baseball at 6:50 PM. 13 U - We will cancel baseball at 5:50 PM. 11 U - We will cancel baseball at 5:50 PM.